The workshop, made of two assemblies, “Presentations of Invited Papers” and “Panel” was organized as an academic session, within PMSummit 2013 Project Management for Urban Development that was arranged by PMI Turkey with the support of ISRC. Theme of the workshop was determined as “ICT and Urban Development” in align with the theme of PMSummit 2013. The following activities were realized related to this workshop which hosted over 75 attendees. 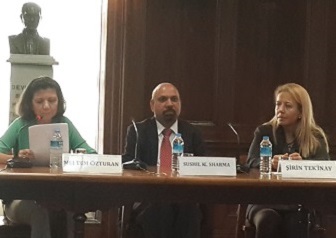 The topic “ICT and Urban Development” was discussed from different perspectives by the following panelists under the moderation of Meltem Özturan. An Abstracts Book that includes abstracts of the papers presented and bios of the speakers and panelists was printed by Bogazici University Publishing House.